Psoriasis is a chronic skin disease that is a result of the immune system sending faulty signals that accelerate the growth of skin cells. Psoriasis is mainly caused by the changes in the immune system, concerning T cells which are a type of white blood cells. Originally, the function of T cells is to provide protection to the body against infections and diseases but in the case of Psoriasis, T cells become overactive setting off other immune reactions. As the dead skin and white blood cells can’t shed off quickly, they develop into thick, scaly patches on the surface of the skin. The most widely prevalent type is plaque which appears as red patches, raised covered with dead skin cells which is silvery white. It might appear anywhere on your body and is connected with grave health issues, e.g. heart disease, depression & diabetes. Psoriases can occur on the skin that has been injured or traumatized. This is called the Koebner phenomenon. Koebner response can be triggered by vaccinations, sunburns, scratches, a cut or scrape and bug bite. Medications: Lithium for bipolar disorder, medicines for high blood pressure, e.g. beta blockers, antimalarial drugs, iodides, Inderal, Quindine, Indomethacin, NSAIDS and drugs that treat certain mental illnesses. Too little or too much sunlight. Psoriasis – How Do You Know If You Have Psoriasis? 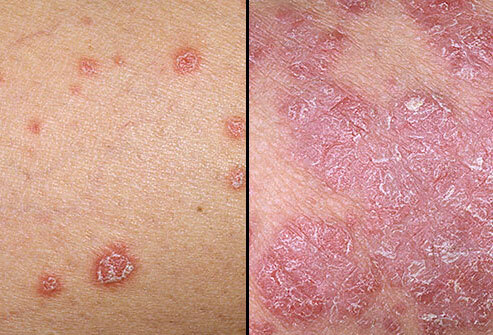 Adults are more likely to be affected with Psoriasis than teenagers and children. The most commonly affected parts of the body are fingernails and toenails. The most common symptoms of Psoriasis are red patches raised skin with silvery scales that are loose appearing on the elbows and knees. Plaques, which are red patches of raised skin, can appear anywhere. Itching, due to abrupt flare-ups or when patches are under the breasts or buttocks. Nail disorders are commonplace with extreme cases. Nail symptoms are tiny holes in the nails, yellowish staining of the toenails and fingernails, splitting of the nail from its root and less frequently, development of skin fragments under the nails. Aloe Vera can be rubbed on the skin up to 2-3 times a day. It helps in reducing scaling and redness. Great at relieving an itchy scalp. A bottle of organic apple cider vinegar can be applied to the scalp several times a week. Capsaicin is found in chilli peppers that makes them spicy. When it is added to creams and ointments, capsaicin obstructs the nerve endings that transmit pain. Add them to a warm water bath. All you need is around 15 minutes. It helps in removing scales and alleviates itching. A moisturizer should be applied to the skin after taking the bath. Have a bath with oats or coating the skin with oats helps alleviate redness & itchy skin. Mahonia is a strong herb that performs its part the fight. Use creams with mahonia, they are helpful in treating mild to moderate psoriasis. No more than 10% though. Extracted from a plant in Australia. It has antiseptic properties and is applied on the skin. It is also found in shampoos that can help with scalp psoriasis. Turmeric has powerful antioxidant and anti-inflammatory properties. Curcumin is an ingredient that has the power to modify gene expression. Pills or supplements with turmeric in them can be taken or adding it in curries is equally effective. Most herbalists consider 1.5 to 3.5 grams a day is considered safe. Sarsaparilla and licorice help in purifying blood. Burdock and Dandelion assist the liver and kidneys and cleanse the system. Menthol, found in peppermint oil or menthol crystals, are effective in relieving itching of the plaques. It can be combined with cayenne soaked in organic olive oil. Shampoos containing coal tar reduces dandruff and dry scales from the scalp. Psoriasis hammers its sufferers relentlessly. It’s painful and can be a humiliating experience going through life with its telltale marks and skin disorders. For any other advice and recommendations please see your local herbalist.